In 1989, a man in Jakarta received a message from God. God told Daniel Alamsjah, then in his 40s, to build a "prayer house" in the shape of a dove, which would be open to all religions. Alamsjah dutifully set about building the prayer house in the middle of the Indonesian jungle, with the help of a couple dozen local residents. "Perhaps because of my Christian faith, people thought I was building a church," Alamsjah told the Jakarta Globe. "But it’s not a church. I was building a prayer house, not a church, but a place for people who believe in God." It opened within a few years and was known to provide youth outreach services and rehabilitation, but sadly the prayer house was never finished. Due to Alamsjah's increasing age and lack of funding, the building has stood abandoned since 2000. 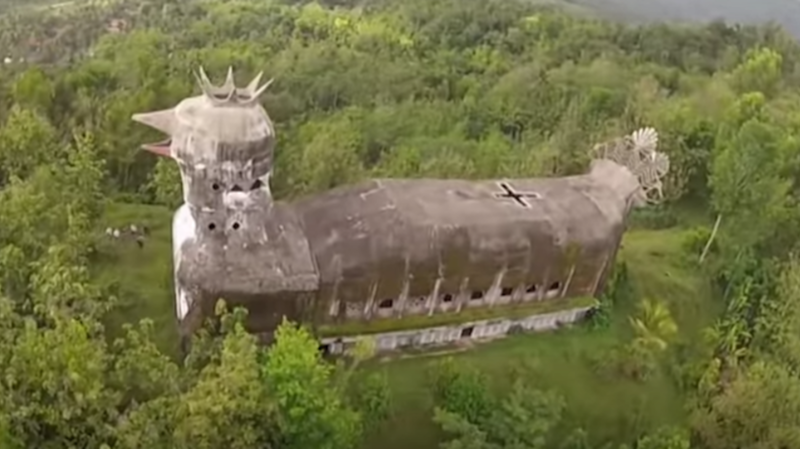 However, it is still a huge attraction for tourists and regularly sees thousands of visitors a year, having become known locally as Gereja Ayam, or "Chicken Church."